Dr D got his 15 minutes of fame yesterday. Let me share it with you as I prepare to get back to the real world. Middle Tennessee Genealogical Society in January, 2014. 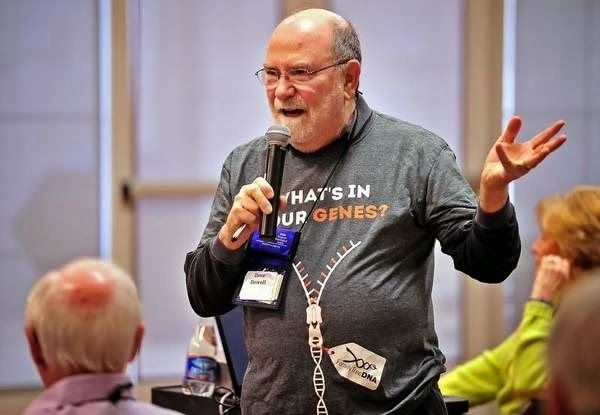 Four weeks ago, Tony Gonzalez, a reporter for the Tennessean contacted me a couple of days before I was to present to the Middle Tennessee Genealogical Society a program on DNA as a new 21st century addition to a genealogist's toolkit. He asked for permission to bring along a photographer (see above). Ten days later Tony interviewed me for two and a half hours and brought along a second photographer. By then I knew that there would probably be a story published. But I had no idea what the focus would be, when it might run or what the placement in the paper would be. There dominating the front page of section one was Tony's story! It was continued on an inside page where the above picture was included. Click on this link to read the full story. 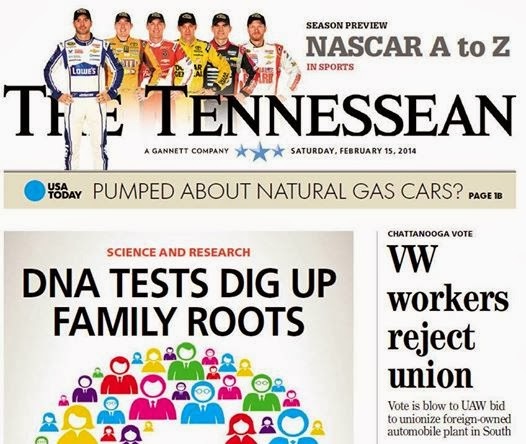 By being considered to be "Science and Research" genealogy had moved from the hobby section of the family section to page 1, above the fold and on the left side of the page! WOW! Now I need to come down to earth, do my laundry and get back to doing genealogy. 1. Girls inherit it from their mothers. 2. Girls inherit it from their fathers. 3. Boys inherit it from their mothers. 4. Boys DO NOT inherit it from their fathers. Of these four rules the last is the most important. 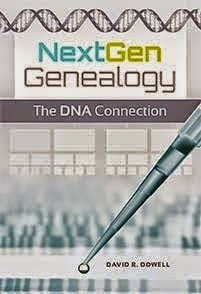 Anywhere on your pedigree chart where there is a father to son relationship, NO X-DNA flows. Y-DNA flows instead. As frustrating as this last rule can be sometimes, it can also be part of the solutions for some of our genealogical mysteries. But like most clues, they only help us when we are paying attention. In December I blogged about a newly discovered 39th Adams first cousin. At the time I was operating with blinders on. Those blinders were a couple of vague recollections some of the local old timers had that an Adams boy may have had an illegitimate child that could have been my new cousin Jim. In my earlier post I had called him Joe to maintain some semblance of privacy. However, now with his blessing, I am "blowing his cover." In my book, Crash Course in Genealogy, Rule #4 for genealogists is "Believe everything and believe nothing you hear or see in print." In my first efforts to unravel the mystery of Jim's birth, I was following the "believe everything" part of this rule but ignoring the "believe nothing" part. DNA does not lie. However, sometimes our ability to read the information it contains is considerably less than 20/20. As a result I started down a wrong path of investigating my four Adams uncles as the candidates to have been Jim's father. This effort now is revealed to have been a waste of time, money and other resources. This week I decided to mount a second investigation. Now that I assumed that we had the investigation of his father under control and that a couple more autosomal DNA tests of strategically chosen cousins would reveal his biological father, I would start to stir the pot about his biological mother. Boy did I have that one backward. If Jim and I share these kind of matches on our X chromosomes our mothers were closely related. Jim's mother must be a sister of my mom. That realization turned our investigation around 180 degrees. Instead of investigating my four uncles to determine which was Jim's father, we needed to investigate my nine aunts to determine which was his mother. What a paradigm shift! The circuit court clerk was surprised that I was tagged with the family name of the father rather than the mother. Apparently it was more common around here at that time for an unwed mother to pass her family name, not the father's, on to the child. When I was three years old, in the circuit court I was adopted by Morgan and Florence Jones and my name changed from James Edward Adams to James Edward Jones. The circuit court clerk will be looking at that adoption record and the birth certificate if available. It feels unlikely that there was any earlier name change. 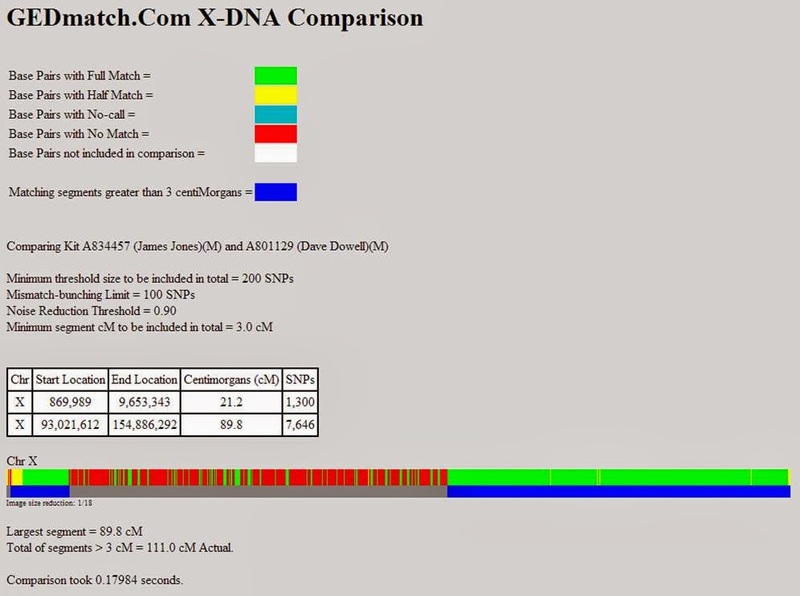 Now based on our X-DNA we know why the file was tagged the way it was in circuit court. His mother was an Adams. So now we have a different task. Jim's mother could not be my mother. We share enough DNA to be 1st cousins. We would need to share about twice as much to be half-siblings. One of my aunts can be eliminated because she gave birth to a daughter the month before Jim was born. Another is highly unlikely because she gave birth the month Jim was conceived. Of the remaining seven, four were still living at home during the 1930 census which was recorded about a year and a half before he was conceived. These four may get our first attention. BUT if we have learned anything, it is not to overlook any possibility until it has been completely eliminated. Labels: Crash Course in Genealogy, GedMatch.com, X-chromosome analysis.